Beloved and accomplished singer, songwriter, and performer Hal Ketchum is suffering from Alzheimer’s and Dementia, and has officially retired from touring. This was the news that was confirmed by Ketchum’s wife, Andrea on Sunday (4-14) afternoon. 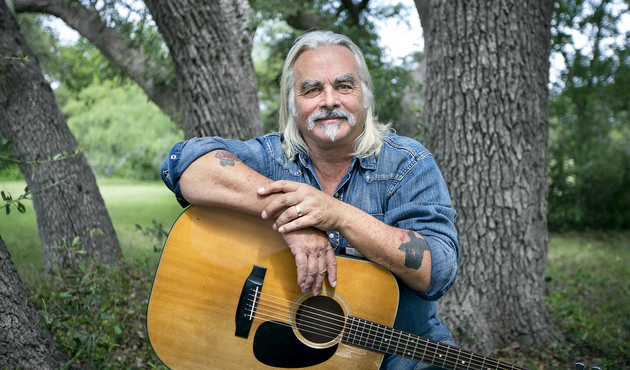 Originally from Greenwich, New York, Hal Ketchum moved first to Austin in 1981 where he began playing small clubs and recorded his first album for the small label Watermelon Records. He later moved to Nashville to pursue a country career further, and was a successful performer throughout the early 90’s. His debut album on Curb Records Past The Point of Rescue was certified Gold, and along with his second record, 1992’s Sure Love, Ketchum charted three #2 singles, and seven Top 10’s. Hal’s music was a little more songwriter based at the time, making him less Garth Brooks, and more Steve Earle. He had another hit with “Stay Forever” off his 1994 record Every Little Word. It was also in 1994 when he became a member of the Grand Ole Opry. But four years later, a diagnosis of acute transverse myelitis—a very similar ailment to multiple sclerosis—sidelined the singer and songwriter, causing him to lose use of the entire left side of his body. Ketchum had to relearn basic tasks, including how to sing and play the guitar again, and recovered enough to continue to record for Curb until 2008 when he retired to his cabin in Wimberley, TX, near Austin. 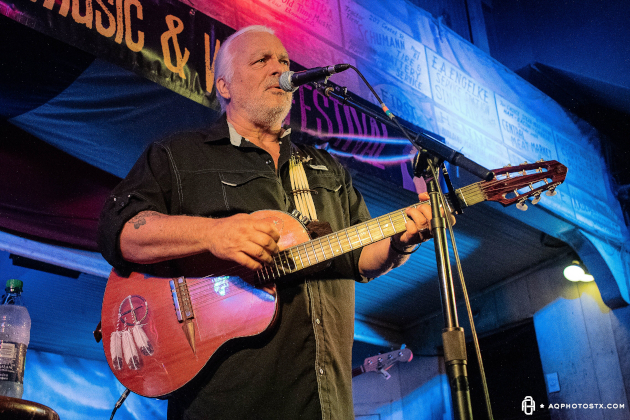 But then in 2014 at the age of 61, Hal Ketchum surfaced once again and began working with Austin, TX-based label Music Road Records, releasing his first album in six years called I’m The Troubadour, and began to play shows more frequently. Lately Hal Ketchum’s tour schedule has slowed down dramatically, which has many fans showing concerns. 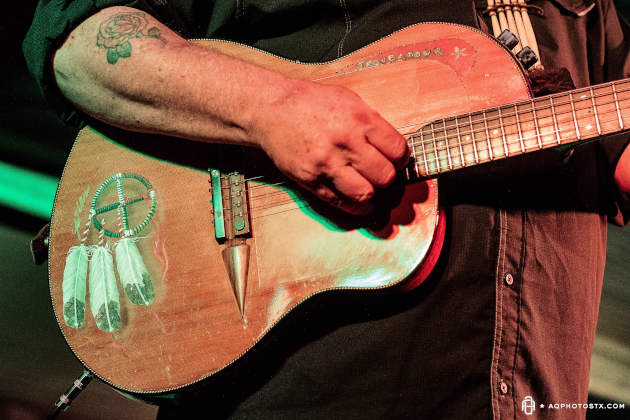 Plans are in the works to somehow honor Hal Katchum at Gruene Hall. 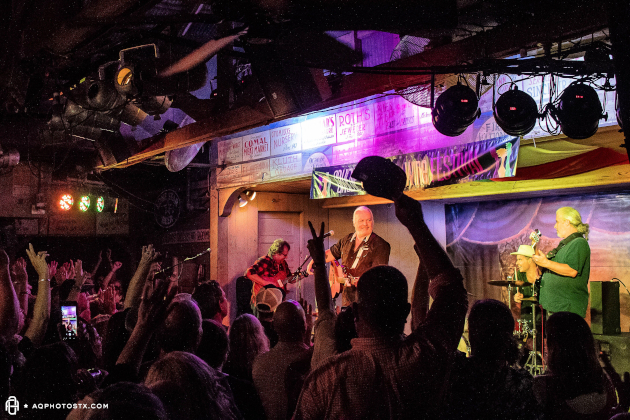 Photos from Hal Ketchum’s last live appearance at Gruene Hall’s Music & Wine Festival in October of 2018 are from Andrew Quinn of aqphotostx.com. He can also be found on Instagram. Solid singer songwriter and great story teller who found success by coming up through the ranks the right way. Great career. Real troubadour. Thank you Hal. George STRAIT is the TROUBADOUR NO ONE ELSE HAS THAT TITLE! A little respect here would have been nice. George doesn’t need your defense. A true Wordsmith and musician. Jerry Jeff Walker called Hondo Crouch an Imagineer. I like to think of Hal Ketchum that way. A unique talent that I will miss. God bless him and his family. Rebecca Jackson Cook was the one that turned me on to Hal with a homemade cassette tape of his music in the early ‘80’s. My favorite song has always been “Love’s a Word For Better Left Unsaid”. My thoughts and prayers are with Hal and his family and friends. Sad to hear this. Prayers for him and his entire family. His first album, before the Curb record days, Threadbare Alibis, was a holy grail find for me. I found it one time at Hastings for only 25 cents. Yet to find it for sale anywhere on the internet. The only thing I found of it was the cassette going for anywhere from 20 to 50 bucks. Great album, one of my favorites I own! I have the fondest memories of Hal‘s show at the wonderful Singer-Songwriter Festival Frutigen in the Bernese Alps in 1990, in the early stage of his career. As the long-time former producer of Swiss National Radio SRF’s Country Special program, I’m proud that we got to record his set and broadcast it to a national audience. Thank you for all the great songs over the years. I wish Hal and his family all the strength they need. Please have him tested properly for Lyme Disease! Remember what happened to Kris Kristofferson. Great memories of my time as a young man in the Corps back in the early 90’s. He was definitely a fixture on local radio back then. I really hate to hear this, I wish him well going forward. In my opinion, his “Past the Point of Rescue” album was one of the finest mainstream country albums of the 90s. Absolutely. There’s a few bands in Nashville that will play songs from that album, and they still hold up. A fantastic work. Thank you for all the years of sharing your talent with us. I once heard a country music singer describe you as being so good that you could even sing the phone book & make it sound good. You have been with us through the years; you’ve been on all our road trips, you sang on the CD player while we built our house, and we will continue to listen to your timeless songs. Thanks and take care. A true loss. Small Town Saturday night is as close to a perfect modern era country song as you can find. One of my favorite songs ever! So my favorite song. He was one of my favorite performers. Went to see him every chance I could. Even after he quit making albums and toured the county fairs. May he spend the rest of his days with family and friends. He has left a large stamp on classic country. There been something special about every Kal Ketchum show I ever went to. It never felt so much like a concert as it did like you were visiting somebody’s house and they pulled out their guitar. Sort of familial. One night at a broadcast of Ray Wylie Hubbard’s Roots and Branches that I was lucky enough to attend my brother-in-law and I bumped into him in the bathroom during a break. We wanted to know if he had built the benches in Gruene Hall as we had always heard that. But we didn’t want to bother him. After a minute we couldn’t stand it any more and had to ask. He just smiled and said “I built a few. Thanks for asking.” What always impresses me with Hal is that whether you see him onstage, or standing at the Gruene Hall bar patiently obliging fans while he is trying to chat with friends, or in a men’s room on a break from a set he is always that same guy. And that is just dang nice to know. Thank you sir for all the good memories of you and your great music!! I always enjoyed and still do like listening to you sing l remember hearing your songs over the years.Gods blessings on you and all the family during this time of troubles you are going though. You will be in my prayers for however long it may take!! What a loss…many great songs & memories of the 90s with this awesome artist. “Stay Forever” is a long time favorite! I am so sad to hear this news. Sending positive vibes and prayers for Hal and family. “Hal’s music was a little more songwriter based at the time, making him less Garth Brooks, and more Steve Earle.”??? I wouldn’t liken Hal to Garth, but I wouldn’t liken him to Steve Earle, either. Earle’s music is characterized by an outlaw persona–he’s always angry and restless and protesting something. Ketchum is much more laid back. Hal was on the edge of the mainstream because he sounded more collegiate or educated than what was fashionable in mainstream country–not bragging about getting drunk, or being a renegade and not using “ain’t” and double-negatives to sound populist. So sorry to hear this…I love Hal Ketchum….he never got the credit he was due..I don’t know if the right name of the some was I know whereLove Lives” but it was one of the first that I heard him do…man I love that song. God Bless and keep Hal…he is one of the best. Beautiful voice and songs that tell a story. One of the greats! May God wrap you in peace and keep you safe. Very very few voices in country music anymore. The hip hop bro country is terrible. Blessings to you and family from me and mine. Hal is one of my all-time favorites. I saw him at the Cain’s Ballroom in Tilsa. A reviewer said he was the John Steinbeck of country music. His songs always told great stories and evoked memories of my own childhood. He holds several spots on my current playlist. Love you, Hal. Sorry to hear you’re not touring. My prayers fo you and your family. God bless you all. So very sorry to hear about Hal having Dementia. May God bless your family and may He give Hal strength and watch over him. Hal’s beautiful songs will forever continue to be special memories for us all and for alot of us, the soundtrack to some of the greatest moments in our lives. Thank you Hal. So sorry to hear this – this disease is so hard on everyone – enjoy every minute of each day and be blessed with the memories. Sad news. It’s hard on Hal but even harder on his loved ones to watch how this condition impacts. Been there. You are all in my thoughts. First of all my deepest sympathy for the family. This is not going to be easy. I am my mom’s only care giver. Diagnosed with Alzheimer’s in 2015. I just have to say one thing about something I read. The article read that he’s suffering from Alzheimer’s and dementia. I can’t pass up a chance to educate. It’s what I do. This is the purpose my mom’s battle has given me. I need to clear this up because, I want others to get the correct information. Alzheimer’s IS a form of dementia. Alzheimer’s is the cause, dementia is the symptoms. Dementia is an umbrella term for a number of symptoms linked to many different causes. Alzheimer’s is the leading cause of dementia. This of it this way. When you don’t feel good you may experience many different symptoms such as a runny nose, sore throat, and stuffy head. Those symptoms can be linked to many different illness. Dementia is the symptoms the illness is the cause of symptoms. Tonight we might just fall in love again is one of the finest two step songs you will ever here and certainly not appreciated enough in my opinion. Heartbroken for Hal.. his family and his fans.. never saw him play but his music soothed my soul when needed while at other times it made it soar with joy. Westcoast Canadian fan. One of my all-time favorites. Thoughts are with the family as they work through the difficulties this disease brings. I always considered Hal one of the greatest singers of the greatest generation of country music. Offering prayers for Hal and his family as they deal with this terrible disease. Recall buying the Point of Rescue album and being a fan ever since. Also saw him in UK on tour. Sad news. Feel for him and especially his family. It is hard on the family to watch the deterioration. You are in my thoughts. Your music has given me so much joy over the years–thank you for all those great songs and the memories that go with them. Prayers and positive thoughts to you and your loved ones. So very sorry to hear this! The honesty and love you brought to the Music scene will forever be cherished and remembered by all. God be with you all through this journey ahead! May you find peace and comfort in knowing that your touring days may be over – but your music shall live on in the hearts of many! Enjoy the next leg of your life journey making memory making moments with your family and friends! God Speed and THANK YOU from a fan in Minnesota! I saw Hal and Kenny at Songbird’s in Chattanooga TN last year and it was the best concert I have ever been to. What a great story teller and the voice is unparalleled, still at 65. Peace to you brother, even though we’ve never spoken I feel as if I have known you for years, due to your beautiful music. You will be missed. Hal, you will always remain at the top of my play list! Listening to your music brings back great & fun memories. My prayers are with you and your family. Prayers for you! Very sorry to hear this. His website recently took down his 2018 tour schedule and I’ve been checking the site for his 2019 schedule. Saw HK at the Franklin Theater a little over 2 years ago. He put on a great show. The most frequently played song in my i-tunes library is a Ketchum song, Daddy’s Oldsmobile. Hal wrote it with David Mallett. A few of his solo writing efforts include “I Miss My Mary”, “She’s Still in Dallas” and “I Know Where Love Lives”. I have enjoyed Hal’s music from the days of “Past The Point of Rescue”. He had a great talent. God bless him and those who care for him. Love Hal’s music, as a broadcaster, I don’t know how many artists I’ve interviewed who said they played Small Town Saturday Night when they were starting out. CKNX still plays your music Hal, it stands the test of time. We wish you and your family well. ~ John Marshall. I am sorry Hal is going through this, we know it can’t be easy for him or his family…Thoughts and prayers. I love listening to his songs. It is a sad thing that this disease is stealing him from his friends and family. May you gather strength from the prayers sent your way. To echo what many have said here , Hal’s vocals are always a notch above EVERYONE’S …the man can sing sing sing ….and with a character that always set him apart and touched us emotionally . Not to mention his ear for a GREAT song lyric and melody ….cause he can sing any and all of it like few can . VERY few . ” Smalltown Sat Night ‘ has been a constant in our repertoire for years .Folks love it . And just yesterday at a huge jam featuring some of the best singers and players in our neck of the woods (Vancouver BC ) some of Hal’s stuff came up ….such a joy to play it . So sorry to hear this one of my all time favorite country singer. God bless you all. May your time together now be very special. Hal was a wonderful musician. I literally ran into him at BNA. Very nice man. I became a fan listening to past the point of rescue.Every track was great no fillers.Your voice and songs will live on for years . May God bless you and your family. I once made a peace pipe for Hal leaving it in the care of a Ohio venue. Years later at Bill Worrell’s Christmas party I told Hal that. The pipe never made it to him. We had a great time at that party with our dear friend Walt Wilkins listening to them trade stories. Hal had always been a favorite and followed every release from beginning to end! I hope he gets his due rest. Aho Hal and thank you! I love to hear all of Hal’s songs. I wish him well and sending lots of prayers for Hal and his family. I loved Hal’s music from the 1st time I heard it back in the 80’s. My Dad worked security pout at the Tulsa City Limits and I had the privilege of getting to see him play there. I am so sorry that he suffers from that awful disease, but at the same time I’m happy that he doing well otherwise. He’s home with his family which is wonderful. No one really truly knows how much time any of us really has here on this earth. So just kick back and enjoy life and this time together. Best wishes for you Hal Ketchum and your family . You have definitely made your mark in this world and in country music! That’s too bad. Pretty good singer IMO. I have to say that from the mid 80’s to the mid 90’s country music had very very long list of artists that had their very own distinctive vocal sound and a lot of those artists had success, you certainly didn’t have to rely on a DJ to tell you who it was like you do today. Hal certainly had a very good voice, I’ve always been thankful to have been able to get to hear and watch such a long list of artist in their prime and all at one time. It was full of all stars. I agree with Mark Miller, love that line ‘Love is a word for better left unsaid’. I will miss seeing him perform. I was a young man in the Navy during Desert Storm/Shield, and I took his music around the circumference of the globe. I sang his songs in Singapore, Korea, Thailand, and on the deck of the USS Harry W. Hill across so many oceans. Held onto ‘every little word’. He taught me the poetry for songwriting. He showed sensitivity in poetry while still being a man. (Threadbare Aliby) If Hemingway was country……I absolutely loved his music! Enjoy your family Hal! This diagnosis has Lyme disease written all over it. I hope they will consider getting him in to see a Lyme Literate Medical Doctor (LLMD) to rule it out. Best to you, Mr. Ketchum, prayers for you and your family! I had the privilege of seeing Hal play in Toronto whenever he would come to town in the 90’s. He always played the same bar and would meet us (I was in local radio at the time) before the show in very informal meet’n’greet in an apartment lobby next door. I remember his gentleness and how he said he liked Toronto because it reminded him of San Francisco. No one has ever compared Toronto to San Francisco before but I get where he was coming from and it showed his unique view of the world. I asked him once how he hits that long note in I Know Where Love Lives night after night. He replied “I just start it and hope the air lasts until the end” I would watch in awe every time as he nailed it. I wish you well Hal and I know it’s not enough, but thank you for the music. Thank you for the music that has been there when I needed it to lift me up or to console me. Please know that all you gave to get on that stage or record that next song was appreciated by those of us who bought a ticket or a cd and listened to every note. I’ll end with what you always said to me in our brief encounters in that apartment lobby. Peace. Prayers for you and your family! It is a terrible disease and I want you to know Hal and his music took me through some lonely years back in the 90’s. Thankful for the hours of music I listened to and it made me feel like I wasn’t alone. Sorry I wasn’t able to catch one of your shows. My nephew is living in Nashville trying to make it in Country Music. He has opened for a lot of famous ones but just can’t get a label. Pray everyday is a blessing for you and your family and God is with you every step of the way. Thank you for all you have given us! Yes, please have Hal tested for Lyme’s disease. It happened to Kris Kristofferson. My husband and I love Hal’s music. Lucky to have been at Greune Hall this past year to see a great show. Our best to your family as you face the future. We are just down the road in Dripping Springs if you ever just want to go for a drive.